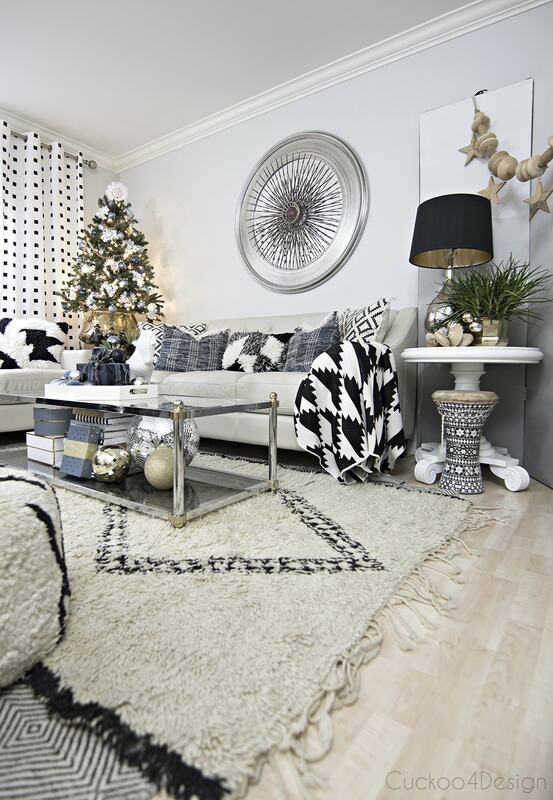 It’s time for Christmas Blogger Stylin’ Home Tours! I love when it’s Christmas tour season (check out some of my other Christmas tours HERE, HERE, HERE and HERE). There is nothing better than snuggling up on the sofa with your device to look at other people’s home’s and what they’ve done. 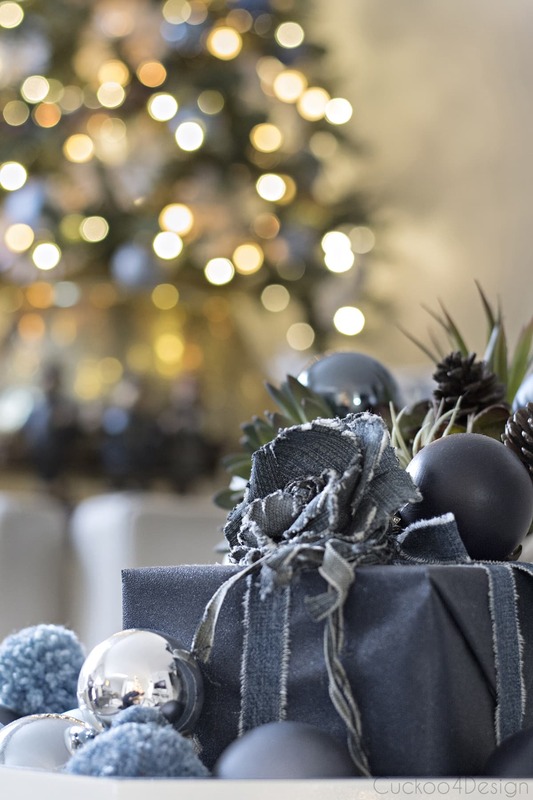 I hope that everyone looks at it for inspiration and the pure joy of Christmas but I know that there can also be a feeling of envy of simply feeling like you aren’t good enough when you look at all these pretty homes. Believe me, I struggle with that all the time. It’s silly and ridiculous but that feeling sneaks in from time to time. So I’m wishing that this isn’t what happens to you and that you just really enjoy the different styles of decor you see with all these tours and blog hops. I’m really thankful to be part of Lindsay’s tours again. You can start the hop on her blog “The White Buffalo Styling Company” by clicking HERE. Her home looks amazing decked out for Christmas. And I’m welcoming all the blog hoppers coming from Amber’s house at the Restless Arrow. I always love her truly unique decor. It’s natural and beautiful with amazing photos. For our home this year I wanted to remain true to what I had done the rest of the year. Believe it or not, I did less than the other years. I just didn’t have the time or energy. I love it regardless. I added more blue and more jeans, hey blue jeans. More silver has a come back and as every year, I made sure that I added all my German Christmas items too. 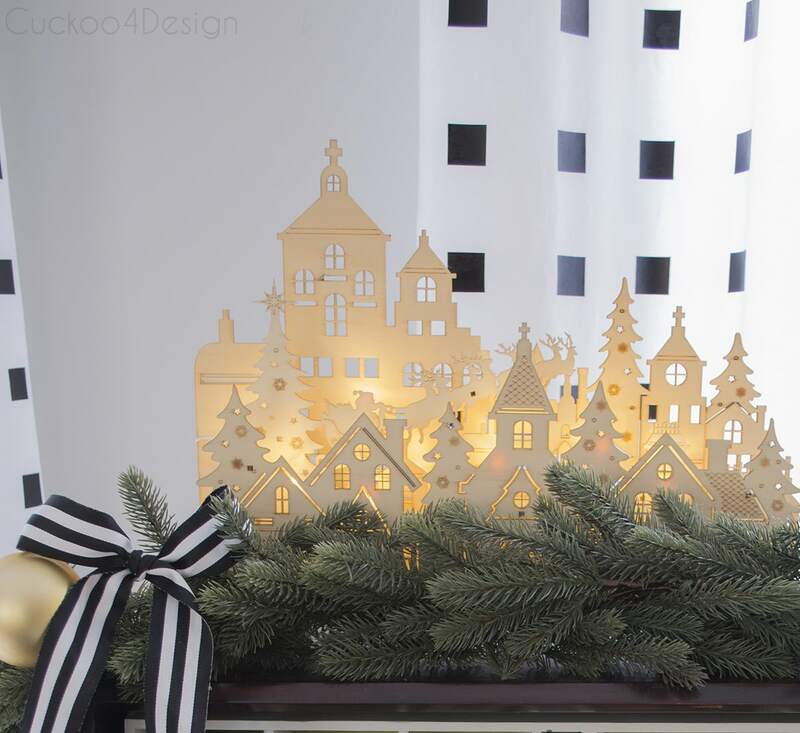 They are part of my decor every year and that’s how it will be…always. 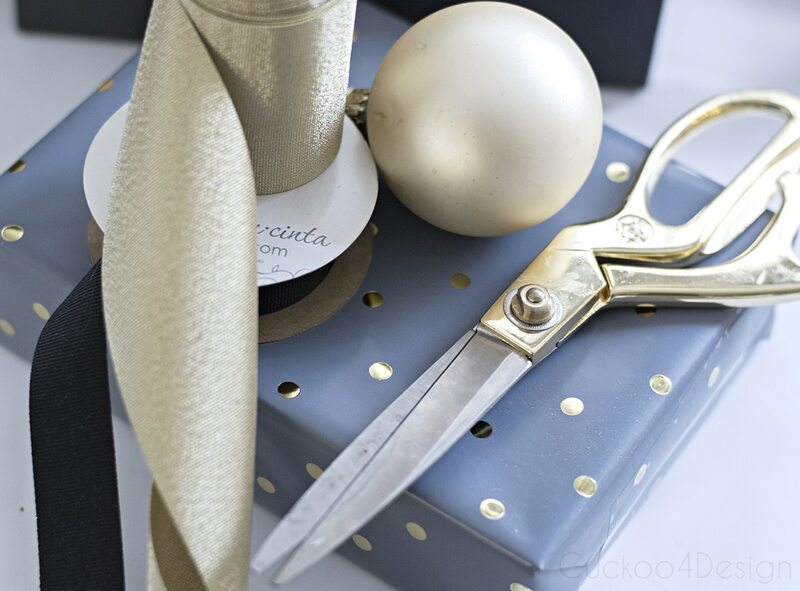 You can find the jeans wrapping idea and sources HERE. 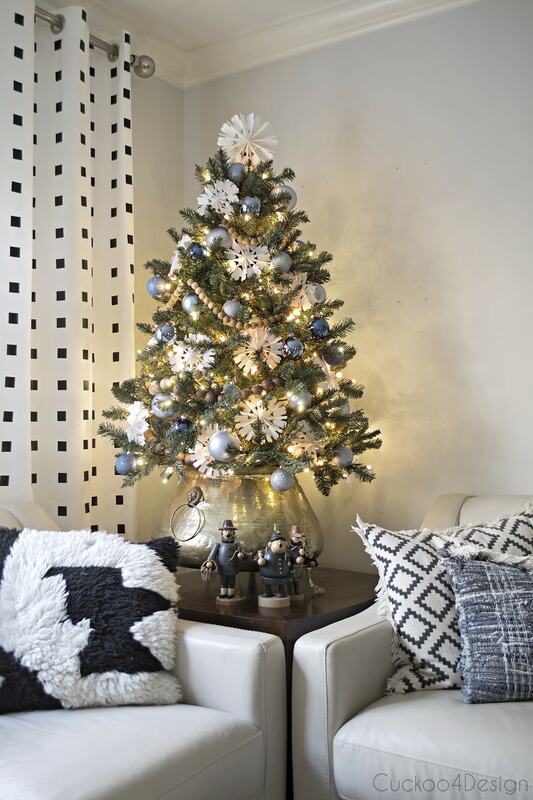 I used some of the blue pom-poms I made (click HERE for my pom-pom tips and tricks), painted some ornaments dark blue, added some old silver ornaments I had and also bought a lot of really pretty blue and also black ball ornaments at Kmart. I would have never imagined them having so many nice ones but they did. Unfortunately they are all sold out already online but you could run to your local Kmart to see if they have some more. Check out these HERE at Walmart or HERE which are beautiful too. The corner tree is a new one from hayneedle and the perfect size for my Goodwill brass pot. You can find it HERE. You can find my DIY Goodwill jean pillow tutorial HERE. 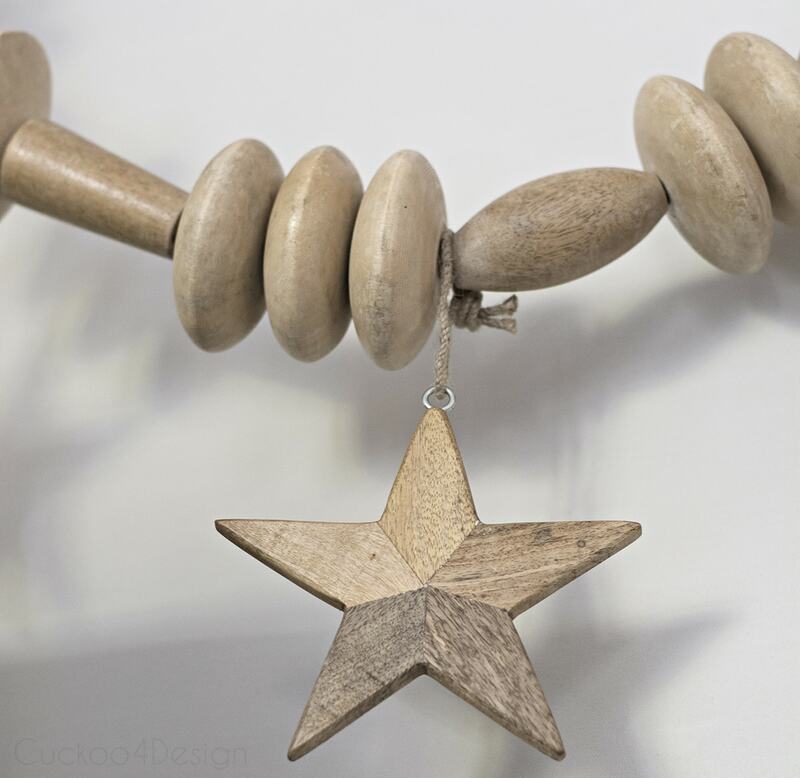 Do you remember the oversized wooden Pottery Barn beads I used to make my kitchen pendant? 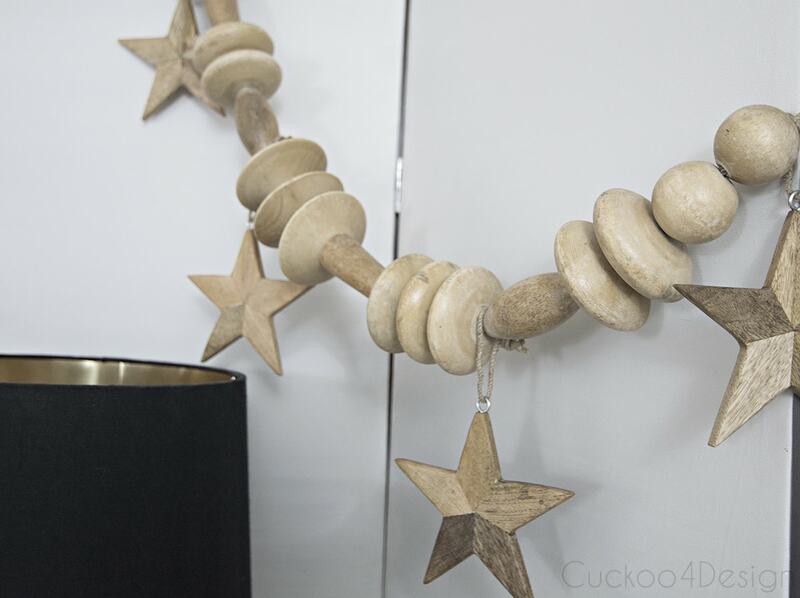 (click HERE if you missed it) Well the remainder I used as a garland in my living room and added some wooden stars to it that I found at HomeGoods when my mom was here. I love the look and they look like they were made for it. 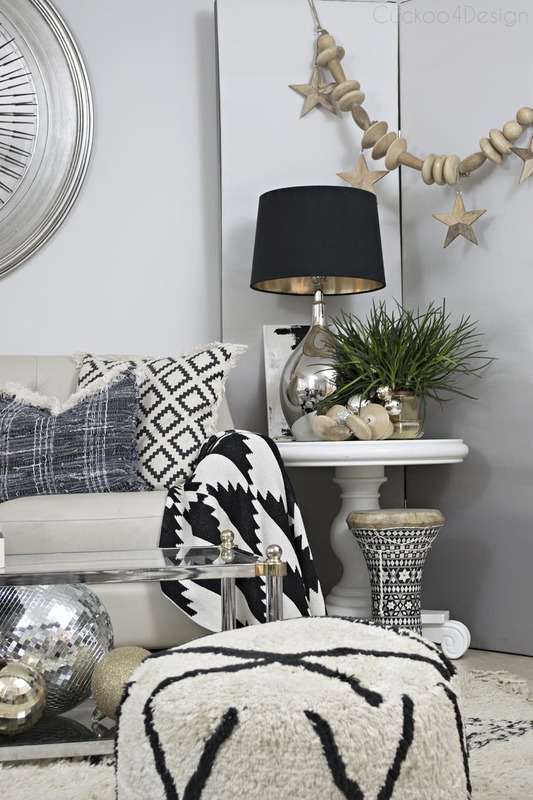 You can also find my ombre room divider tutorial HERE. 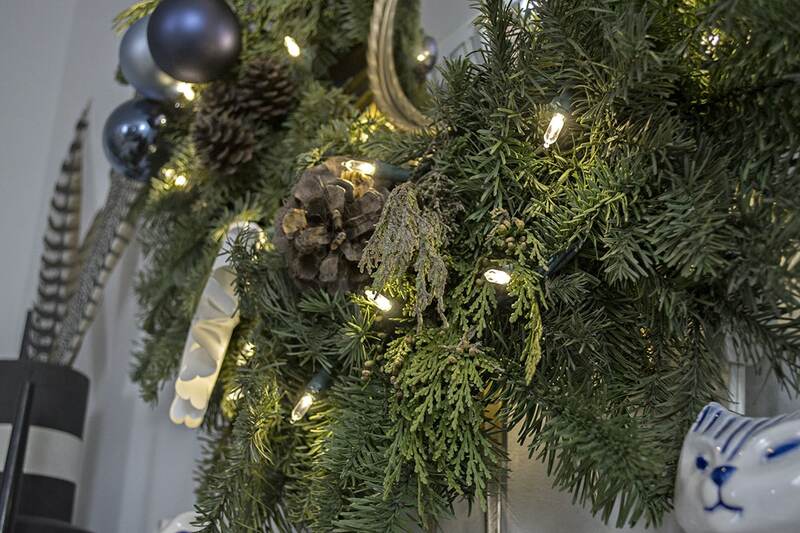 I’ve searched high and low for a similar garland but all I found was this one HERE which is very pretty as well. I bought the little wooden village at HomeGoods and it reminds me of Germany. I love it but haven’t found a similar one online. I also added some real real greenery to the top of my TV cabinet. Sorry the photo is a tad bit blurry. With all the gloomy rain it was really hard to take nice photos. Our German smoke men appear every year even though after owning them for over 16 years they are missing a couple of parts. But we love them regardless. I brought the vintage runner from my parents house back into the hallway which you can see as a blurred out backdrop to the flocked tree. I still love the flocked tree which we got last year. My neighbor’s went and bought one right away too because they loved it so much. It’s still available HERE. And all the snowflakes I made (click HERE for the tutorial) ended up on all my trees. So affordable and make a big impact. Again, you can find my locker Christmas tree HERE and the smaller one HERE. 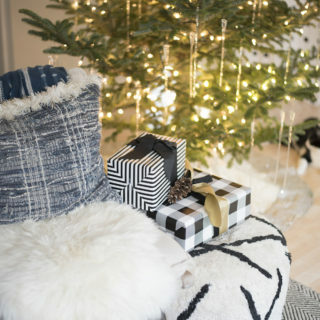 I bought the tree skirt last year at Kmart but you can find a similar one HERE. And so far I’m not sick of my little horse bowl with the succulents. I still love it and am keeping it. It just shows how many times I can change it up just a tad bit. This photo of my Christmas tree made me laugh because I didn’t notice until I was all done taking pictures, editing them and writing this post that I noticed that my big snowflake I had made as a tree topper fell off and is hanging to the right side. Well oops! I guess at some point I need to retake the photos of our tree but I didn’t have time to do it yesterday since I was working. It happens right? 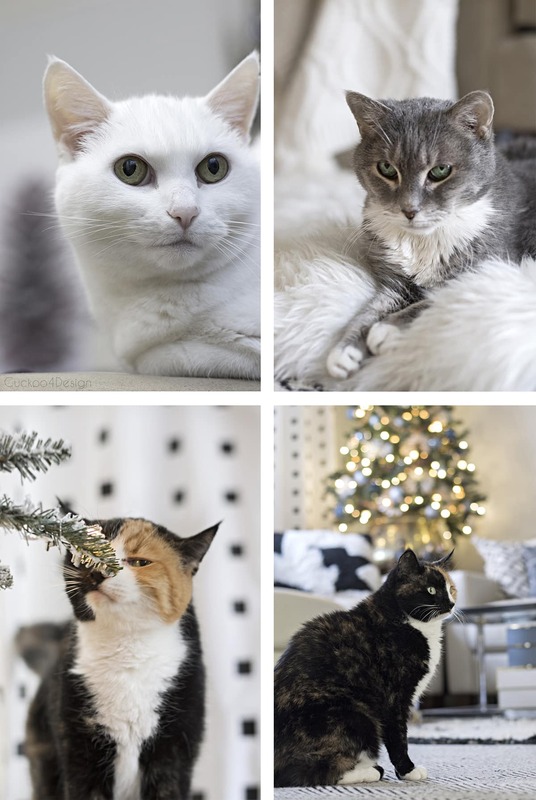 Our kitties always enjoy the Christmas season too with all the snuggly layers, trees and their human family being inside of the house more. 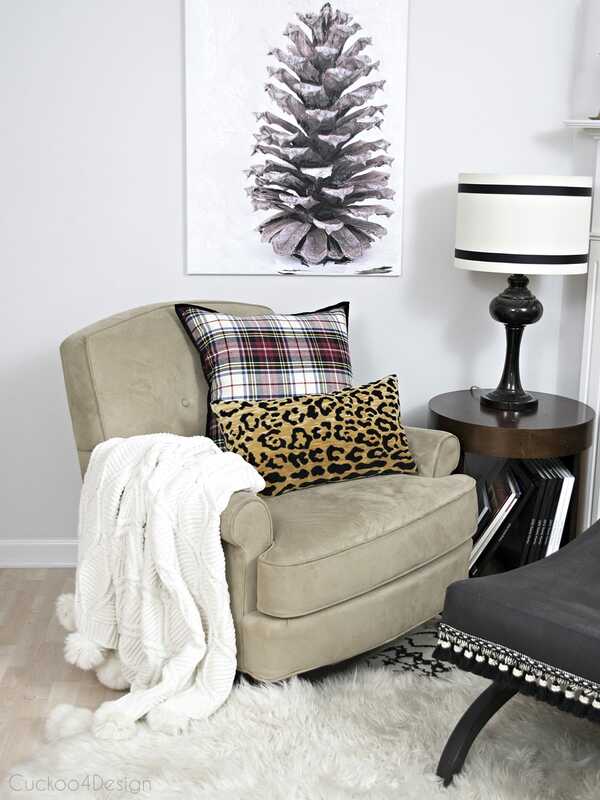 If you missed my easy pinecone art DIY then you can click HERE to see it. 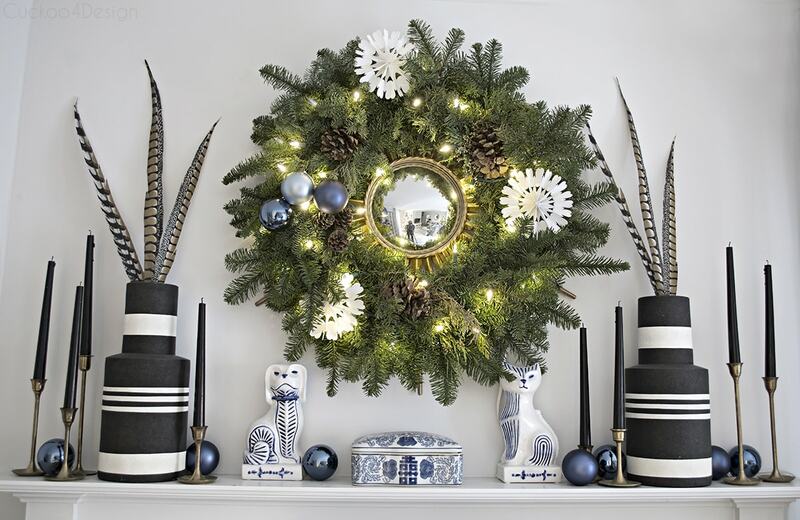 This year I used a real pine wreath filled with lights, pinecones, some of my DIYed snowflakes and some blue ornaments. If you are wondering how I hid the cable, it’s running down behind the cat on the right side and is then hidden by the ball ornaments, candle sticks and vase. 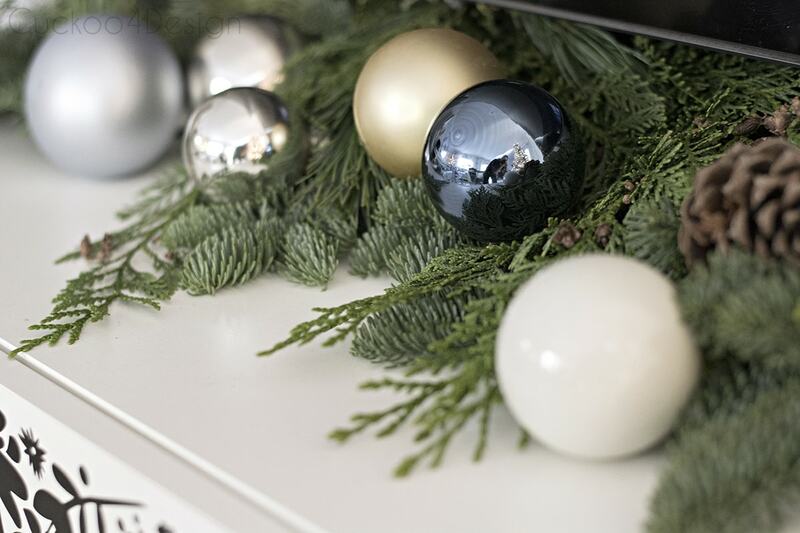 You can see my post HERE about how to hide cables on a mantel. There are always objects that reappear every year because I love them so much but I also like adding some new things here and there. I hope you enjoyed this year’s decor (see last yea’s tour HERE) in our little house with more to come and Merry Christmas. 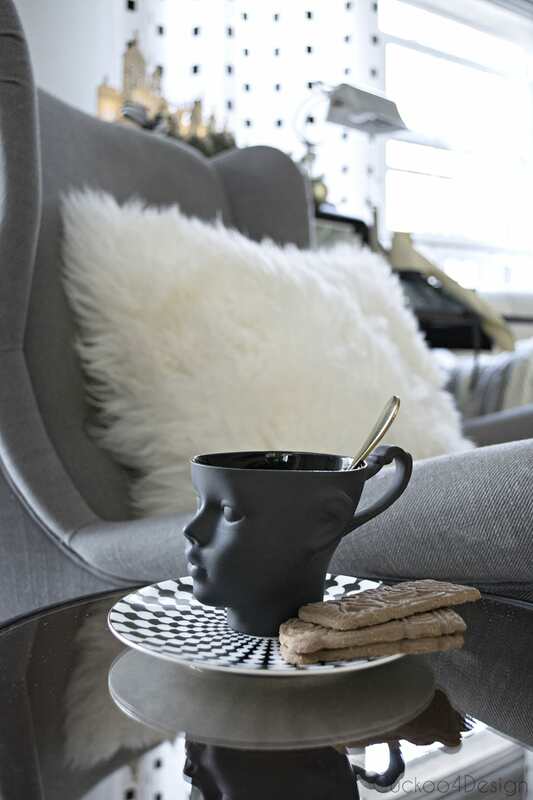 The blog hop continues tomorrow morning at Corinna’s house A Designer At Home. So make sure you stop back to see all the other beautiful homes. 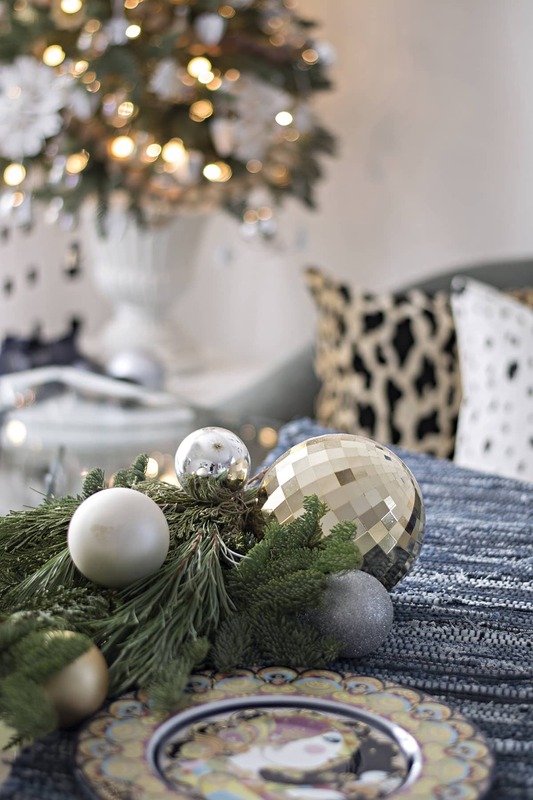 I love the blue accent – so sophisticated! WOW! your house is beautiful, julia! i love your unique color scheme and all of your texture and shine! your trees… ohmygosh! and the denim roses… you outdid yourself! I love this decorations so much! The colors, the shades are perfect! I love it! You have the best style. Bringing in the denim is such a cool idea. 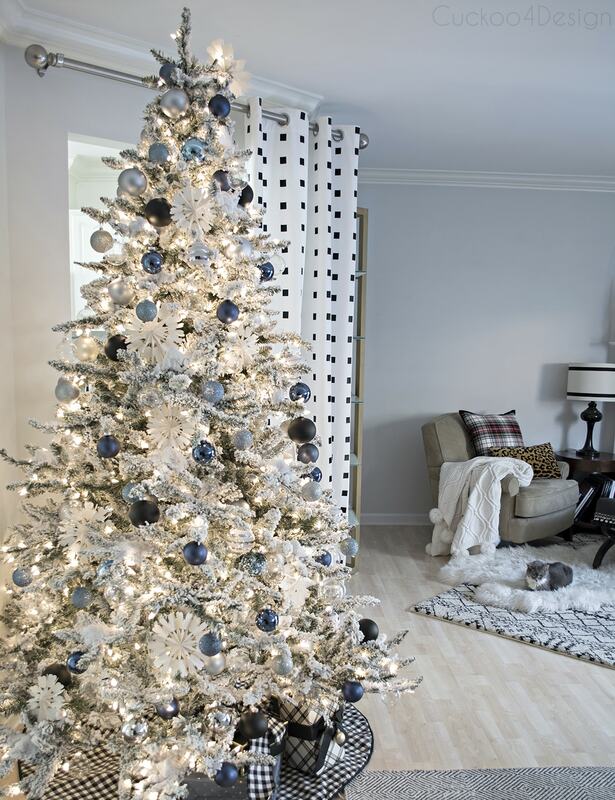 I also love the flocked tree, I wish I had one of those…. one day! Such a different but sophisticated pallette for Christmas. I love it and it is totally you! Gah! I spelled palette wrong……. Your tours are always so fun to see Julia! 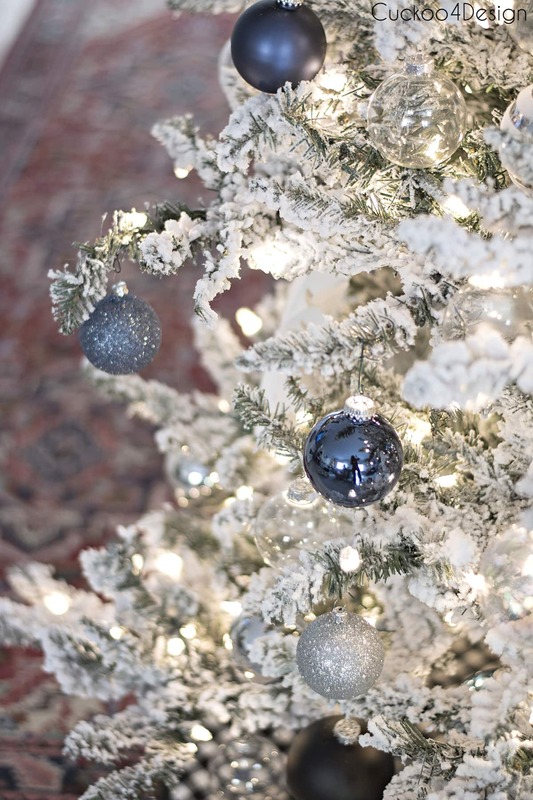 I love how you left the photo of the tree and fallen snowflake…haha! Classic and reality! So perfect, I think us bloggers should start showing those kind of photos more! 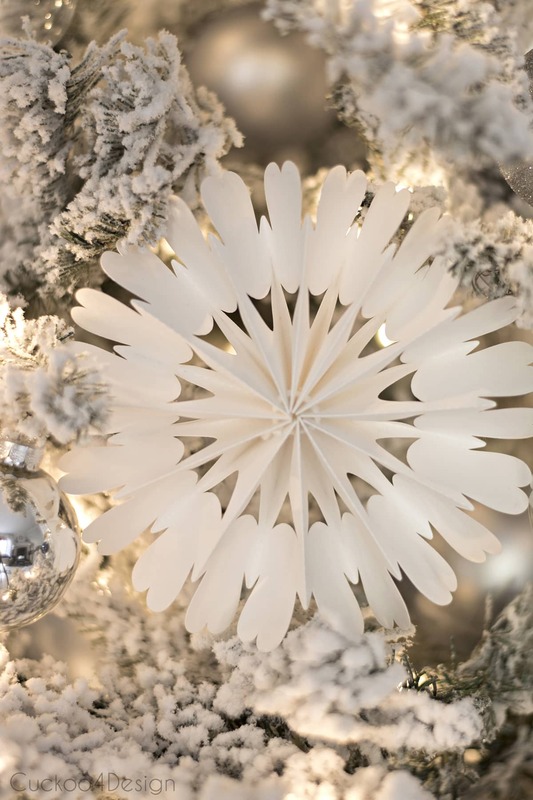 I love your paper snowflake idea and think I may have a fun little project now for my boys. Merry Christmas to you sweet friend! Oh wow! So beautiful and sophisticated! Looks like a professionally decorated NYC apartment! I love it. This is so stunning! 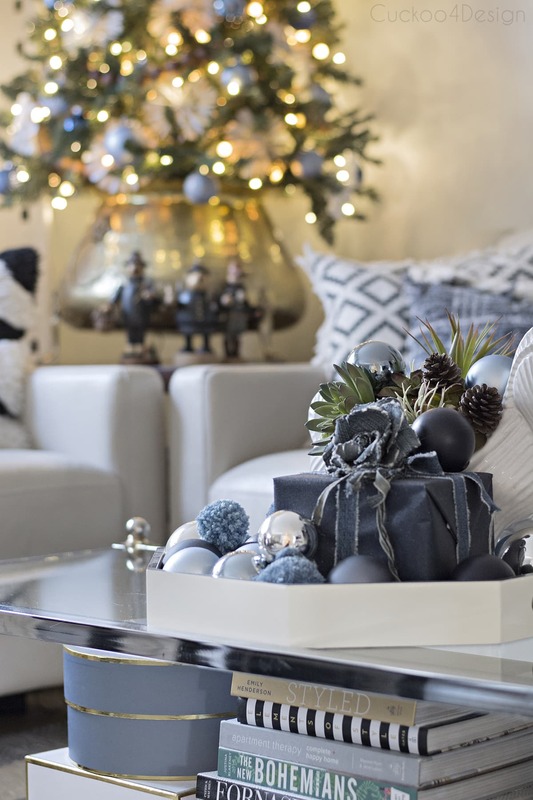 I love how you kept your signature black and white base and infused blue…speaking to my heart because I’m equally obsessed with blue this year! Gorgeous, my friend! 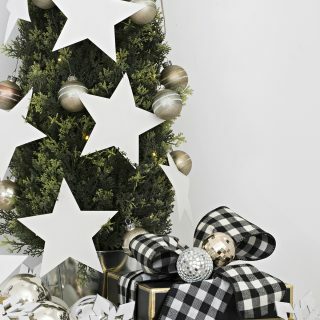 As usual, your decorating is just over the top!!! 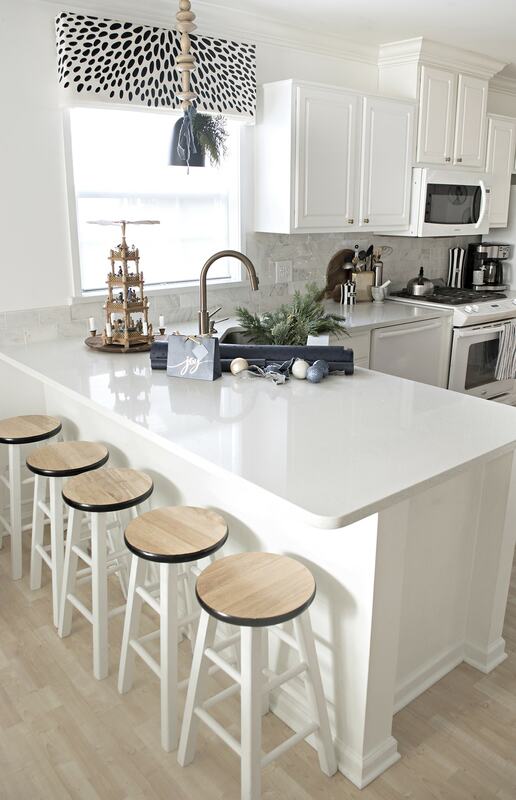 You have such talent and I love seeing how you use it in your home! Love all the German touches-reminds me of our Christmases in Germany and especially trips to the Christkindl market in Nuremberg. Thanks for sharing your home with us! Oh thank you so much Jen. I really appreciate it. Everything is absolutely beautiful! So much so, I want to come and spend Christmas at your house instead of with my family (but don’t tell them). I think my favorite it the little ‘town’ you have on top of your desk. Such a great touch! Absolutely love it! I AM DYING OVER THE DENIM. Like, I just want to grab a pair of old jeans and change everything in my house. So clever and cute. Everything looks amazing. 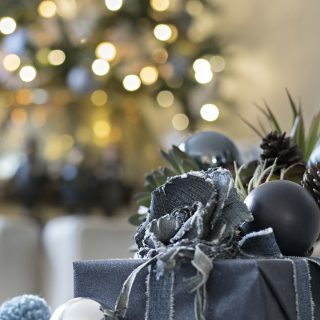 Your Christmas decor is fresh and unique, I love how festive it is. I enjoyed the tour! It’s so fun to be a part of these tours, thanks for inviting us in Julia. Thanks so much for the visit and the sweet words Melissa. 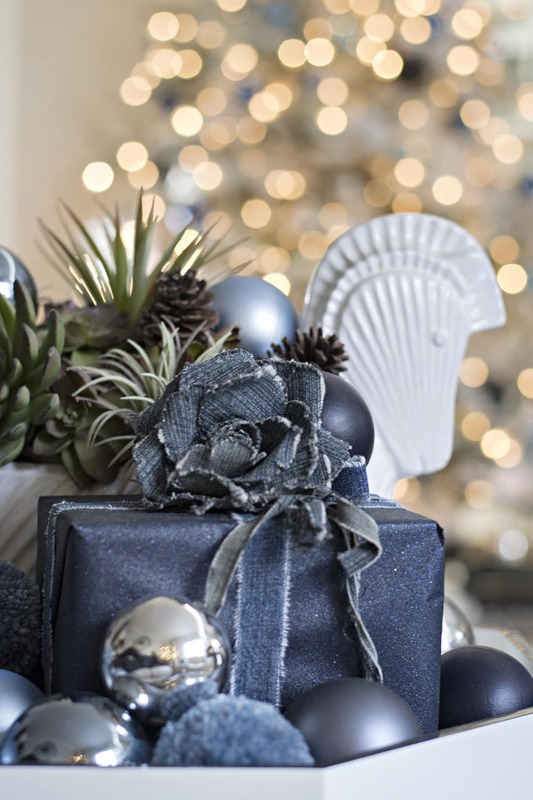 I’m wishing you a wonderful holiday season. You have the most blingiest home of all time! 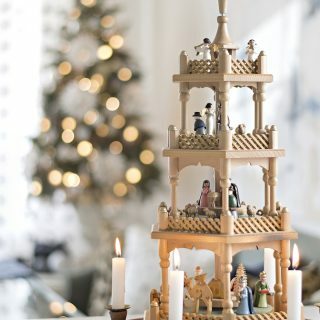 Love your wood beads and that wood Christmas village and of course your cats are the meow! 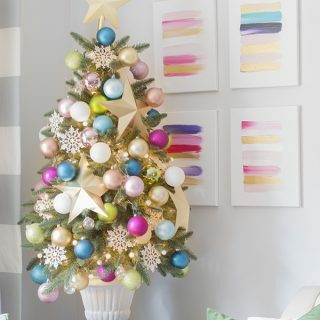 What a beautiful color scheme and adore your tree..so pretty! 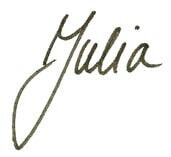 Happy Monday, Julia! Wow, this is just SO beautiful! Beautiful! 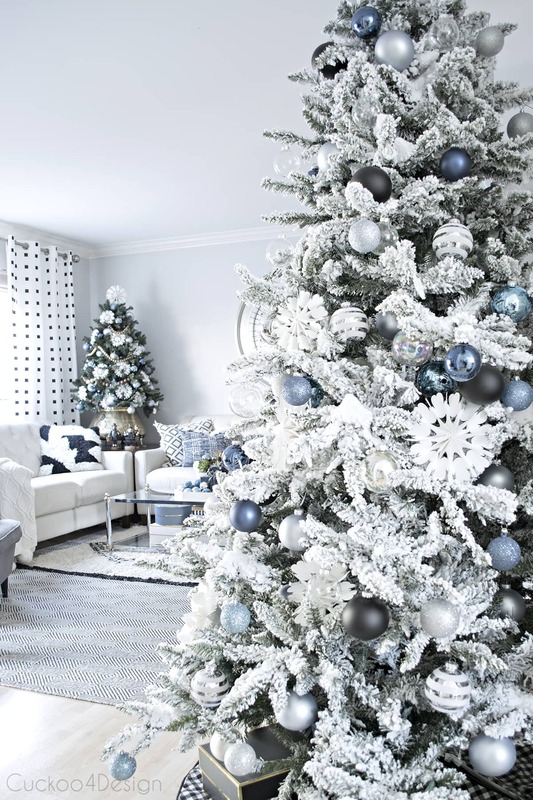 The blue is not overpowering – it gives that icy glow, and a very serene feeling. Very inspiring! 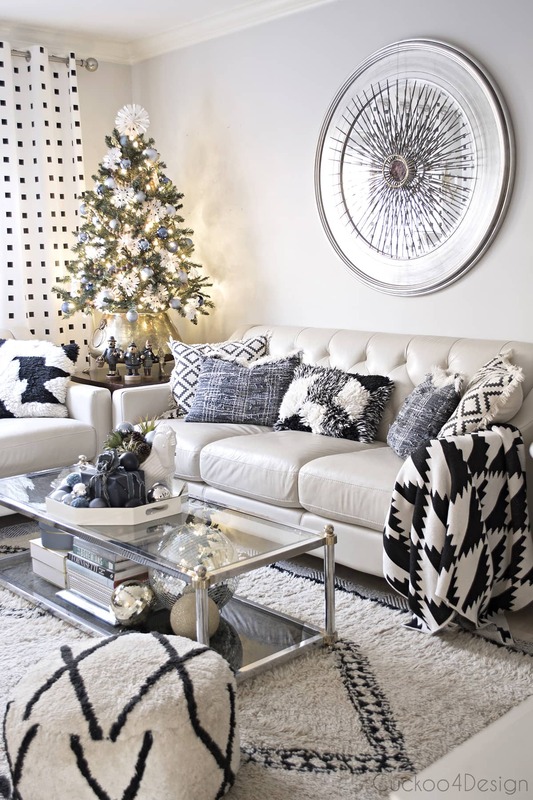 I love this more modern tendency very much, even though I am traditional. You did an amazing job, everything is beautiful, the vignettes, the trees, and that fabulous coffee table. Thanks for sharing. I am pinning. 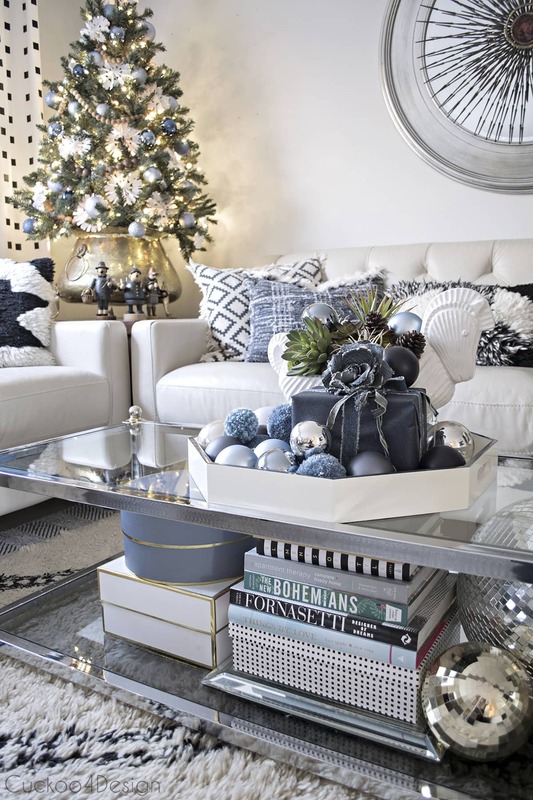 I love the blue with all of your black and white decor! It’s really lovely and warm! I love the beautiful blue hues! It’s so perfectly you, and soooo pretty. Oh, and those kitties? Darling. Your home is gorgeous as all ways! Merry Christmas Julia! 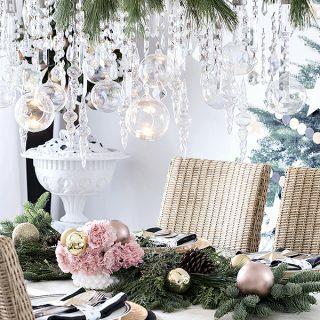 Your holiday decor is equal parts drama and glamour! 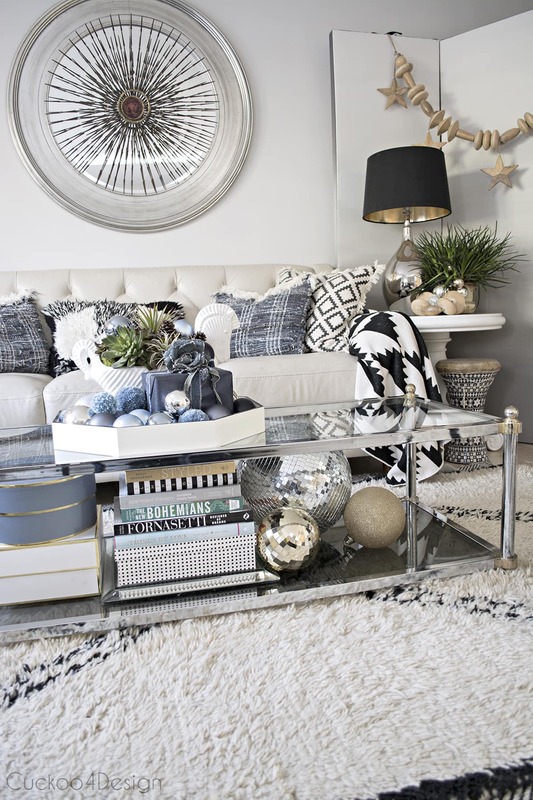 Bravo on a beautiful home tour, Julia! 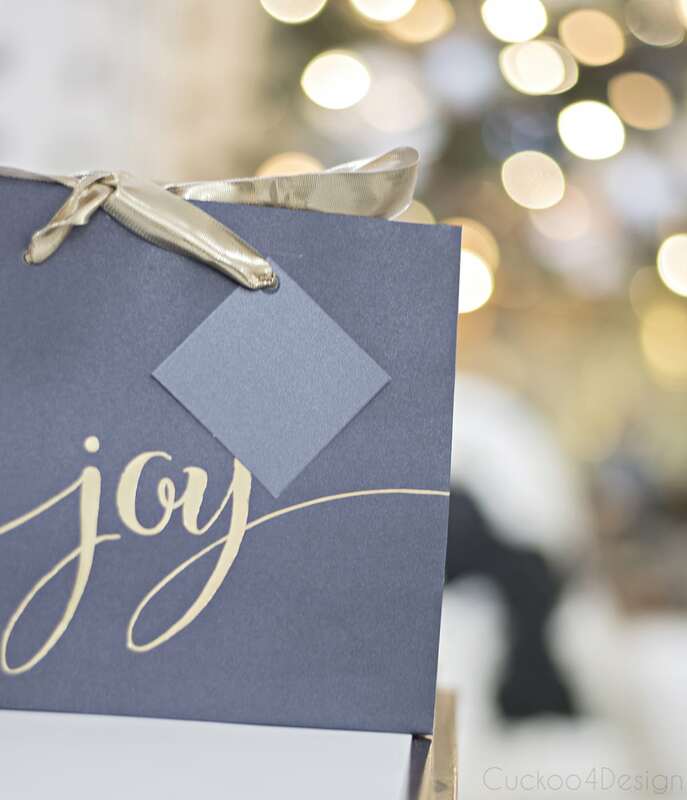 Wishing you and yours the very merriest of Christmases this year! 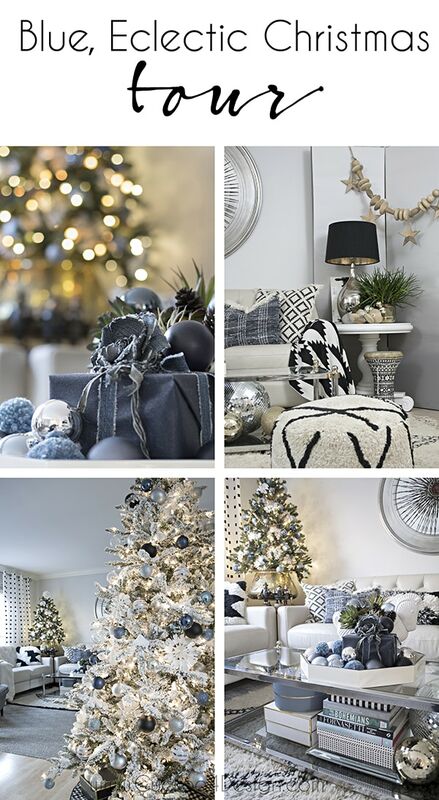 Love your colors, I too am a lover of black and white and blue and white. 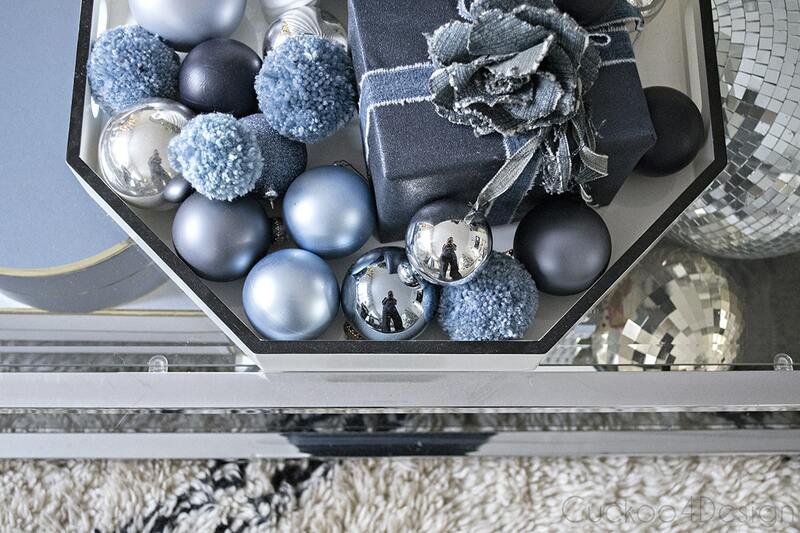 I added navy, cobalt and greens this year to my base of Christmas colors. Could you share where you got the house silhouettes. I love that vignette. Thank you! Insanely awesome! This color palette is the bomb! I hope you’re not going to get tired of all the blue you’ve been using recently anytime soon, because I don’t think I’ll ever get tired of it :). 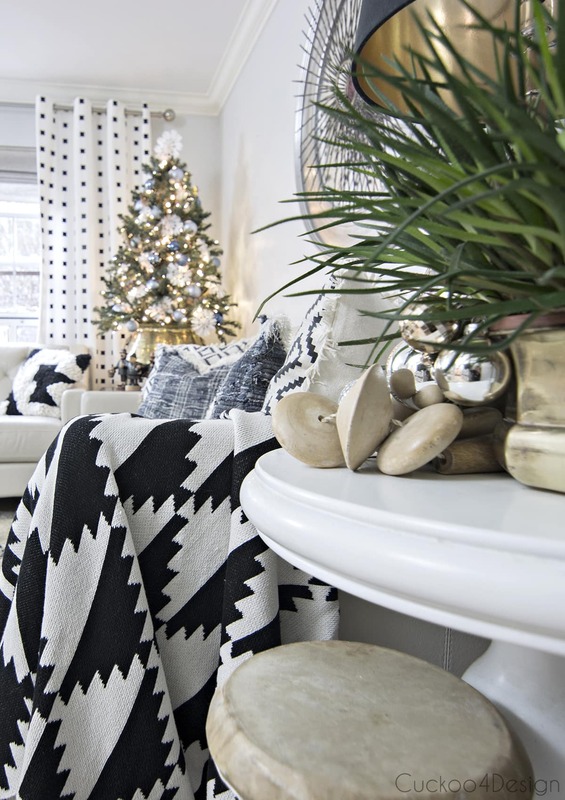 Everything is just beautiful–and two trees in one room! nice! Absolutely gorgeous, Julia! 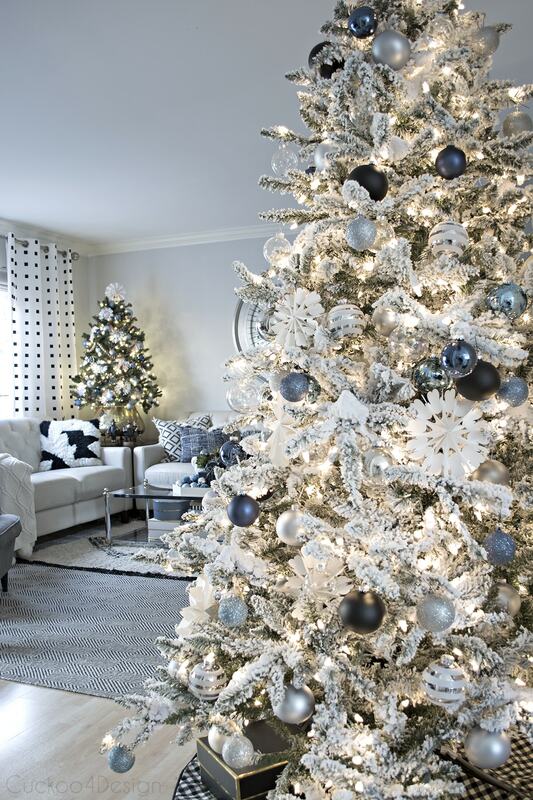 I love the flocked tree… it just might convince me that I need one too!! !